Shepard boasts a distinguished career in Architectural Preservation. Since 1970, Shepard has worked with the archaeology program in St Augustine in architectural restoration and reconstruction. He has consulted on architectural stabilization and preservation at La Isabela, Concepción de la Vega and countless sites throughout Florida. He earned his Master of Fine Arts in Architecture degree at Princeton. He is a leader in Florida’s Historic Preservation programs and is a research associate with the local Historic St Augustine Research Institute at Flagler College. an FES member (not required) interested in receiving more information about FES? 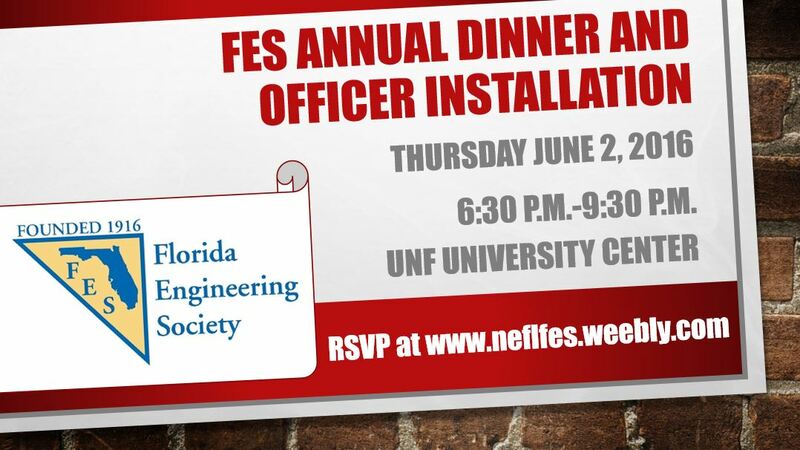 interested in receiving information about FES Young Professional Events? a student? would you prefer a vegetarian meal? In case you have not heard, Lat 360 has closed its doors. We are looking into other venue options for our monthly luncheons. Please join us in February for the E-week events and check back here for details on the March monthly luncheon!! Thank you, Mr. Sheffield for presenting at our September luncheon. If you missed the presentation, here are a few pictures from the event. Make sure to sign up for October's event sponsored by ASCE.